Partial funding for this project was obtained through the Federal Aid in Sport Fish Restoration Fund. Since 1992, the Fish and Wildlife Research Institute (FWRI) has produced a statewide series of educational guides that targets boaters and anglers to inform them about Florida's coastal and marine ecosystems. Each Boating and Angling Guide describes a major bay, estuary, or region. Each Guide contains a map, or several maps, that best display the area’s environmental information and complementary written text. This format appeals to boaters and anglers by explaining the natural world about them, and by informing them about boating and fishing facilities. The maps serve to display the distribution and extent of marine resources, while the written information explains the importance of marine habitats to the health of the marine ecosystem, as well as how boating and angling behavior can impact the environment. With support from the Sport Fish Restoration Program, FWRI develops these guides through cooperative efforts with county, state, and federal agencies as well local and regional organizations. Most of the information depicted on these guides is derived from the FWRI Marine Resources Geographic Information System database, which is kept as current as possible by FWRI staff. FWRI provides technical support in the form of cartographic layout and design and works with local partners who provide information and secure funding. Even though local partners influence the design and content of the guides, the Guides are all part of a single series. Each one is unique in showing the important areas defined by the local community. To date, over 2.5 million guides have been printed, covering almost all of Florida’s coastal waters. These guides are available without cost at many marinas, tackle shops, boating supply stores and other marine businesses; or by visiting FWRI’s Outreach and Education’s Publications page and clicking on the Brochures link. Map side of the Boating and Angling Guide to Tampa Bay. 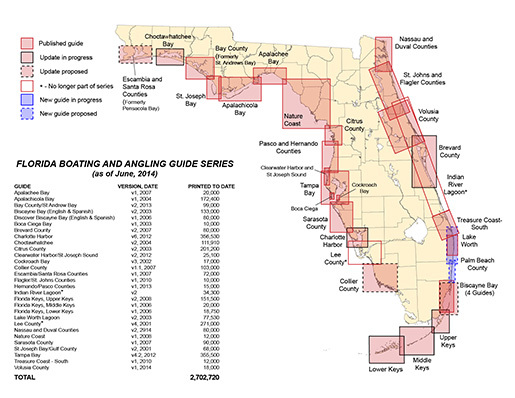 Boating and Angling Guide Status Map - January, 2014 (PDF, 899 KB). In an effort to continuously improve the quality of the Guides, the FWRI gathers feedback from users through on-on-one conversations at boating and fishing shows or while in the field, as well as an online survey. This information is carefully reviewed and wherever possible used to help design future Guides. The addition of aids to navigation, more depth contours, bridge heights, fishing piers and DEP Clean Marinas with pump-outs to the Guides were in response to requests from users. FWRI has now Web-enabled the Guides to enhance access to these by the user community. Fully interactive Web sites were created for Tampa Bay and the Florida Keys and others are in process. These interactive Guides provide all the information contained on the printed Guides, as well as detailed maps, interactive maps, pictures of each boat ramp and fishing pier, and fishing regulations specific to each area. FWRI is also working to make the printed Guides available via the Web. Users will be able to view digital versions of the printed guides which contain text about the area, an updated resource directory and copies of both sides of the Guide for viewing and printing. These basic digital versions will have pan and zoom capability only. This Web site was designed and produced by Chris Anderson, Fish and Wildlife Research Institute. The Florida Boating and Angling Guide Series was designed and produced by Chris Anderson, Kathleen O'Keife, and Henry Norris. Partial funding for the Florida Boating and Angling Guide Series was provided by the Federal Aid in Sport Fish Restoration Fund. The Sport Fish Restoration Program collects money from taxes on fishing equipment and boat fuel and distributes the funds to projects that improve fishing and boating opportunities. The Florida Fish and Wildlife Conservation Commission is not responsible for omissions, misrepresentations, or factual errors. Maps available through this Web site should not be used for navigation. All photographs in this Web Site are courtesy of the Florida Fish and Wildlife Conservation Commission, unless otherwise specified. Copies of and of the Boating and Angling Guides around Florida can be obtained from the Fish and Wildlife Research Institute. If you have any questions, comments, or suggestions about this Web site, please e-mail us at Boating_Guides@MyFWC.com. Would you like to receive notices of changes to this Web site and the Florida Boating and Angling Guide Series? If so, please e-mail us and include SUBSCRIBE-BAG in the subject line.